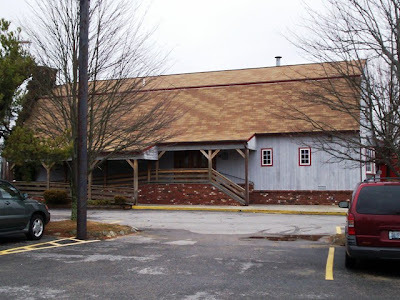 Although Mom and I are probably two of the youngest people that visit the Country Inn Restaurant in Warren, RI, we are crazy about it. After a failed attempt at having lunch at Swansea's Venus De Milo (who knew they opened at 5 p.m.), we decided to stop by our old haunt just knowing that we would be in for a delicious, home-cooked meal. Even though my last visit wasn't so special (I choked on a fish bone), I couldn't wait to try my hand, and throat, at another piece of scrod. We pulled into the large parking lot at just around 3:45 p.m.
After walking up the stairs (there is also a large ramp) and through the small waiting area complete with country decor and large benches, we met up with the hostess who quickly showed us into the first room on the right hand side. It was fairly dark in there, but it made everything more cozy. When we first went in, there was only one other couple seated. Mom and I knew that we had come at a good time, because this restaurant tends to fill up quickly between 4-5 p.m. The hostess handed us two laminated paper menus which included a typed list of Saturday specials. Mom and I were soon joined by our waitress, who we could smell before we actually saw her. No, not in a B.O. kind of way, but she seemed to be lathered in perfume. A little much for people who are going to be dining, in my opinion. Perhaps overkill was her thing because her makeup seemed to be lathered on as well. As superficial as this sounds, it was a little distracting. She did not introduce herself, but was very polite and quickly took our drink order while leaving a bread basket at our table. Mom and I both ordered Diet Cokes, which quickly arrived in real glasses. Since I already knew what I was getting, but Mom was still deciding, she asked the waitress for another minute so that she could narrow down her choices. When the waitress returned, both Mom and I were ready to order. 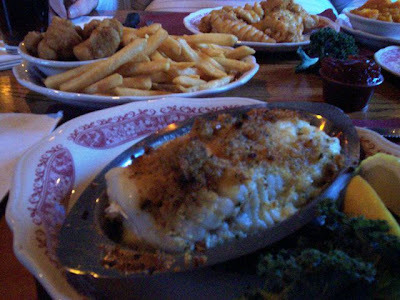 I chose the baked stuffed scrod ($12.75). Since it came with potato and vegetable, I chose the fried cauliflower and fries. Mom ordered the fried boneless chicken ($9.50). For her potato and vegetable, she chose butternut squash and mashed potatoes. Both meals came with soup or salad, so I chose white New England Clam Chowder (I was surprised to hear that red was offered - the impostor) while Mom chose chicken soup. The waitress quickly returned with both soups. They were very good. 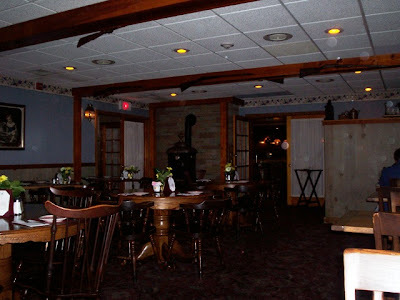 Dining at the Country Inn is like stepping back in time decor-wise. Perhaps that is one of the reasons why it draws an older crowd, but I know the other reason - older people know where to get a good meal. In our particular dining room was a large cast iron stove, a plethora of country decorations (roosters, horseshoes, pictures, old guns, etc. ), and beautiful floral curtains that covered the windows facing Route 136. The printed rug and the large wooden rafters made the room feel very inn-like, while the old-fashioned wooden tables were topped only with mauve place mats to ensure cleanliness. Small lamps were situated around the room while vases with faux flowers sat on every table. Also on every table was a small list of specialty coffees and desserts, all which were deliciously described. Mom likes this particular dining room because she said that it is less frantic than the other ones. Apparently people like to dine at the bar or near the large fireplace that is in the neighboring room, but nevertheless, she was right about the frenzy. The other dining room, separated by glass doors, was getting rather crowded by the minute. Although the Country Inn is a classy place (with the waitstaff in black and white uniforms, etc. ), the weird music playing in the background seemed to be very out of place (European techno). At Country Inn, they specialize in comfort food. Appetizers and salads include the antipasto ($7.50), clams casino ($6.95), peel and eat shrimp (1/2 lb. - $8.95; 1 lb. - $14.95), stuffed mushrooms ($6.95), and the sirloin steak Caesar salad ($12.95). Sandwich specials include the New York sirloin steak ($8.95), lobster salad roll ($15.25), and grilled chicken ($6.95). They also offer Country Inn Clubs such as the hamburger ($6.95), steak ($9.25), and the tuna ($6.95), all served with fries or cole slaw. Italian sandwiches include the veal ($7.25), sausage ($5.25), and eggplant ($4.75). Country Inn is all about meat, and they certainly offer a lot of it. 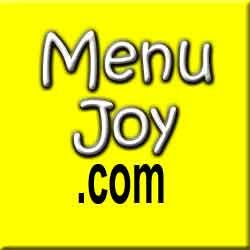 Seafood fantasies include broiled by scallops (market price), baked stuffed shrimp (3 pc. - $14.95; 4 pc. - $16.95), baked scrod ($11.50), and clam zuppa ($11.95). Deep fried seafood is also available such as the fish and chips ($9.95), fried oysters ($14.25), and fried seafood platter (market price), which includes fish, clams, baked stuffed shrimp, fried shrimp, fried bay scallops, smelts, and a stuffed quahog. Now, when you're ordering your meat, there is a diagram to follow on the menu. It goes from extra rare, which is described as having a "purple, cold center" (*gag*), to well, which is "gray center." Still sounds gross, but I'll take gray over purple. Meats include veal parmigiana ($13.95), veal piccata ($14.75), chicken Francaise ($12.25), chicken Marsala ($13.95), broiled pork chops ($14.75), Filet Mignon ($21.95), and the Steak a la Mama ($19.50). You can also order pasta, American favorites such as Yankee pot roast ($9.75), and Italian delights such as meatballs, peppers, and fries ($8.95). They also have a list of side dishes, desserts, and extras. Although the restaurant was starting to get busy, Mom and I had not be left waiting for very long. Both meals arrived steaming hot and looking great. One of the great things about Country Inn is that the food always arrives steaming hot - an A+ in Mom's book. She has such a high tolerance for hot food, and hates when food is served luke warm. At first, Mom thought the waitress had made a mistake. Her chicken looked like several pieces of fried fish, as in fish and chips. However, it was chicken - fantastic chicken (served with a side of cranberry sauce). All the pieces were very moist, perfectly done, and coated with a very light, crisp batter. Mom thought they were absolutely delicious. Her meal was served with a mound of homemade mashed potatoes (which she couldn't finish) and a separate dish of butternut squash, which was sweet and tasty. The whole meal was a delight. Mom couldn't get off that chicken! I DIDN'T CHOKE! All fish bones stayed out of my throat this time around. My fish was superb - white and flaky with a buttery crumb topping. I squirted some lemon over the top for an extra kick. The stuffing used was a mixture of what looked like a seafood casserole and actual stuffing mix. Fabulous! It was very tasty, and I ate every bit of what was served in that little metal dish. Unfortunately that meant that I had to leave a lot of fries, which were great, and fried cauliflower behind. I enjoyed the fried cauliflower, but I think frying a vegetable kind of takes away the purpose of having a vegetable with your meal. With the fries, I think it was a bit much (my own fault for picking the two together). When our waitress saw that we had finished, she came back over to our table. Mom and I contemplated taking home our leftover sides, but we were in for a day of shopping, and didn't think that fried cauliflower and butternut squash would hold up very well in the back of a Kia. Believe it or not, the waitress made us feel very uncomfortable about leaving behind food. She asked us why we were not taking it with us, and we told her about the shopping - not that we had to. I hate having to explain myself to people. I understand that it is part of her job to ask if we want to take our leftovers home, but when we say no, just live with it! Believe me, I am not a food waster. Perhaps I wouldn't be so "curvy" if I left some food behind, but don't make me feel guilty about leaving behind fries. As she lingered and slowly asked us if we wanted dessert, Mom and I shocked her by saying yes. Since we had left behind our sides, she probably thought that we were all done. Hah! 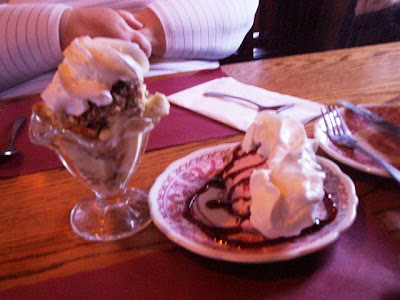 Not when grapenut custard pudding ($2.95) and spumoni with melba sauce ($3.50) is on the menu! We ordered one of each, and the waitress hesitantly brought them out. When she saw that I was low on soda, she offered to bring me out another. She actually seemed disgusted when I asked for water instead. Boy, we were really annoying this woman. Either way, our desserts were yummy. For $2.95, Mom received a very generous portion of grapenut pudding. It came in a fluted goblet and was topped with whipped cream. Grapenut pudding is kind of a New England classic. A lot of people outside New England have never even heard of it, but they are missing a fantastic treat. It's a cold, creamy textured pudding (although sometimes served warm) and it has softened Grape Nut cereal swirled throughout. It's absolutely delicious. Whenever Mom sees is, she often orders it. My spumoni was very good and was also topped with a dollop whipped cream. I love the weird combo of the pistachio, chocolate, and strawberry ice cream. It was cold and creamy - just what I needed after my hot meal. We were able to find out the waitress's name (it was on the bill), but decided to keep that anonymous for this post. Even though she was an oddball, she was just doing her job. I left $42 on the table for our waitress, including 20% tip. Before we left, Mom and I decided to use the restroom. I spotted a basket of take-out menus on the way and quickly grabbed one. The restroom was pretty much clean, but a little disheveled. This happens often here, and we don't know why because the rest of the restaurant is usually spotless. Either way, we left there satisfied and looking forward to going back. 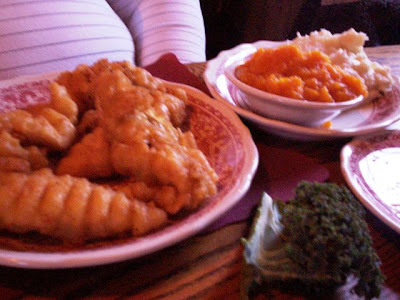 Even with the nosey waitress, Country Inn still remains one of our favorite places to dine. Country Inn Restaurant is open from 11 a.m. to 9 p.m. Monday through Wednesday, 11 a.m. to 10 p.m. Thursday through Saturday, and 11:30 a.m. to 9 p.m. on Sunday.